On Friday, November 22, 7:00-8:00 a.m., the men of the Church will have a Prayer-Bible Study Breakfast in the Dining Room. All men of the Church are invited to participate. The Rev. Dudley Colhoun was Rector of St. Paul’s at the time. The idea for the ministry emerged following an October Faith Alive weekend at St. Paul’s. Inspired by the event, a group of men decided to provide the men of St. Paul’s an opportunity for small group Bible study on a weekly basis. 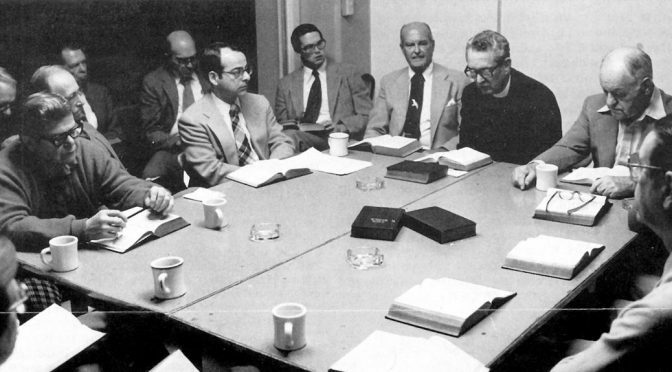 About six years after Dudley Colhoun retired in 1991, the group voted to re-name the Bible study and prayer breakfast in honor, and now in memory, of Dudley. For 20 years, beginning in 1992, the group coordinated St. Paul’s support for our medical missionaries, Doctors Shaw and Sharon Yount. Shaw, who grew up at St. Paul’s, was trained as a family practitioner and Sharon was trained as a pediatrician. They worked first in a clinic in Zimbabwe and then later at the Hospital Loma de Luz on the northern coast of Honduras. Theirs was a hospital-based evangelism, bringing people to Christ through meeting their medical needs. Now that Shaw and Sharon have returned to Winston-Salem, Shaw is a member of our Friday morning Bible study group. The names and faces have changed over the years, but much of what was written in that early edition of Parishlife remains true today. Breakfast is prepared now by Denice Golsby, who arrives at St. Paul’s long before the men arrive at 7:00 a.m. The cost of breakfast has risen over time, but at $6.00, it is still a bargain. All men of the church are welcome to come and be a part of this dedicated group of St. Paul’s men. The group currently has between 15 and 20 men who participate every Friday morning (except for the Friday after Thanksgiving and the Friday between Christmas and New Year’s Day). Members take pride in preparing for their turn as “rabbi,” leading the readings and discussion. It a close-knit group, with all members concerned for the health and well-being of the other members. On Friday, November 21, 2014, the group celebrated its 40th Anniversary. In addition to the usual study of the lectionary, the festivities included a reading of a letter written for the occasion by the Rev. Don Goodheart. For the ten years I served as Rector and then again during the six months I was Interim Rector, the Friday Morning Men’s Prayer Breakfast always meant a lot to me. I never missed a Friday unless I was out of town. Why? Heaven knows I did not enjoy getting up early enough to get there on time. My wife would tell me that she got quite tired of hearing me complain on Thursday evening about how I had to get up early on Friday. I know some people are early risers by nature, but I am not. In any case, I did find out fairly quickly that you do not want to be late. You do not want to be relegated to the “second row;” no, a seat at the table is critical to enjoying the full experience of the Men’s Prayer Breakfast. I could say the reason the Prayer Breakfast was so meaningful is that I love studying the scriptures, and that would be true. I do enjoy every opportunity to reflect upon God’s word. After all, God gave us the scriptures for a reason. They are our “lamp” to guide us in life. We are to “read, mark, learn, and inwardly digest” them according to the Prayer Book. But it is more than that. I could say the reason is that I love to pray in a group, and that also would be true. “Pray without ceasing,” St. Paul tells us. Prayers are such an important part of our Christian walk. They sustain and empower us. But it is more than that. I could say that it was Denise’s fine cooking, and that also would be true. She cooks the best bacon and the best grits of anyone I know! But again, it is more than that. I could say that it was the contributions we made to missions, especially the Younts of course, because mission is a critical part of Christian calling. Again, however, it was more than that. Indeed, I would attribute it’s meaningfulness to two related factors. The first is that fact that the men take turns leading, being the “rabbi,” as we would say. I loved hearing the unique perspective that each person brings to table. I loved the fact that it was not clergy-dependent. Yes, I took my turn along with everyone else, but the Prayer Breakfast did not depend on me, or Dudley, or Charles Tabor, or any of the other clergy. I loved the give and take of the discussion and the application of the scriptures to our own lives. I also like the fact that it was not limited to Episcopalians or members of St. Paul’s. That openness again enabled everyone to hear different perspectives. The related factor is the natural development of Christian fellowship that occurs in the group. We get to know each other and develop a bond that I believe Christ intends us to have. If a member of the group is sick we pray for him, visit him, or call him and he knows that prayer support is there. A good example occurred while I was there as Interim. Tyson Swain was going through some difficult times, but people would bring him whenever he was able to come and we always prayed for him. Again, he knew that prayer support was there and it meant a lot to him right up to the end. So Happy Anniversary, Men’s Prayer Breakfast! I do wish I could be there. Please keep Ronnie and me in your prayers. Some of you know that Ronnie’s mother recently died and I was privileged to have a close bond with her along with Ronnie. At the same time we were able to spend quite a bit of time recently with our youngest grandchild, Henry Goodheart (at 14 months). Indeed he was with us and my mother-in-law during her final days and it was wonderful to see them together. Life goes on, and so does the Men’s Prayer Breakfast, I hope, for many years to come! May God bless each and every one of you always. All men of the St. Paul’s parish are invited and encouraged to join the Dudley Colhoun Men’s Prayer Breakfast.